In 1789, when Alexander Hamilton began his role as the first United States Secretary of the Treasury, he may still have been “young, scrappy, and hungry,” as the lyrics go. Today, however, he would be over 260 years old. While many have discovered an interest in Hamilton’s life through Lin-Manuel Miranda’s Hamilton: An American Musical, my connection with this founding father can be found in banknotes portraying his likeness and his role in our nation’s monetary history. 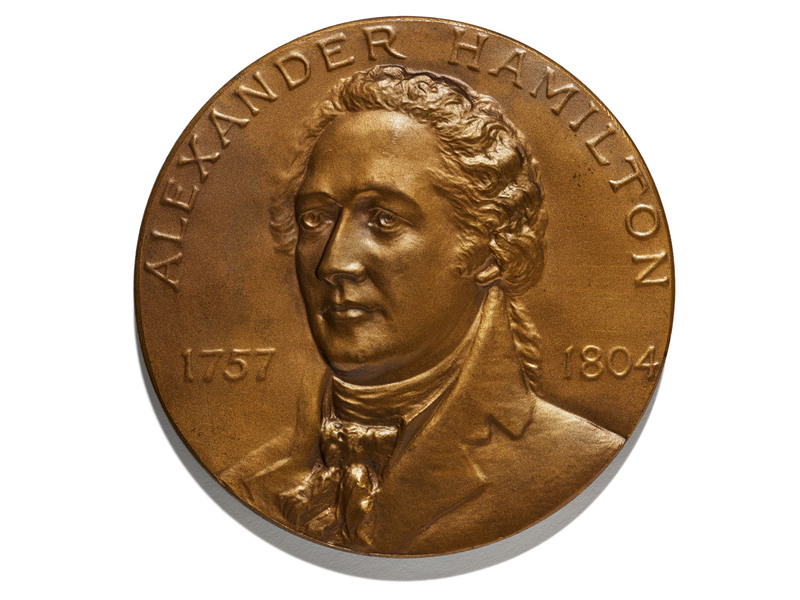 As a member of the museum’s National Numismatic Collection team, I’m not throwing away my shot to share this side of Hamilton’s story with you. President George Washington appointed Hamilton as the first United States Secretary of the Treasury in 1789, a position Hamilton held until 1795. During his term, Hamilton set up America’s financial system, favoring a strong central government. This made him unpopular with some of his contemporaries, including Thomas Jefferson and James Madison, who favored state government. Despite opposition, Hamilton called on Congress to establish a national bank and the U.S. Mint. His policies, based on the Bank of England and European economic systems, became the foundation of United States economics. After leaving office, Hamilton returned to his law practice and continued to be influential in politics until 1804, when he was shot by Aaron Burr in a duel and died from his wounds. Lawyer and politician Aaron Burr signed this check, dated 1790, in the amount of 200 pounds. In 1804 he challenged Alexander Hamilton to a duel and fatally wounded him. Though Hamilton was integral to the establishment of the U.S. Mint and helped move the Coinage Act of 1792 through Congress, paper money was not popular at the time. The federal government did not begin issuing paper currency until 1861, well after his death. These first notes, nicknamed “greenbacks,” were used to pay for Civil War efforts and are the first instance of Hamilton appearing on national currency. This $5 Demand Note from 1861 features Thomas Crawford’s statue of Freedom at the left and a portrait of Alexander Hamilton at the bottom right. The Demand Notes of 1861, nicknamed “greenbacks” because of the ink color on the reverse, were issued in denominations of $5, $10, and $20. Hamilton continued to appear on currency of different denominations, designs, and issues, and he is still featured on the $10 bill today. Though the portraits vary, Hamilton has appeared on more denominations than any other historic figure since 1861. The notes shown below demonstrate a small sampling of variations in size, design, color, and denominations of U.S. currency depicting Hamilton. Although these notes all have similar features, including a portrait, a serial number, and signatures of Treasury officials, it was not until the Series of 1928 that U.S. federal currency was standardized. This second issue Legal Tender $2 note from 1862 also features a portrait of Hamilton. This $20 Legal Tender note from 1878 depicts Hamilton at the left and Victory with her shield and sword at the right. This note, featuring Hamilton at the right, is a $1,000 Gold Certificate from 1882. Unlike the greenbacks, gold certificates have orange backs, a color which represents the gold coin for which they could be redeemed. This is a $1,000 Federal Reserve Note from 1918. Federal Reserve Notes were authorized under the Federal Reserve Act of 1913 and are still the type of banknote used today in the United States. The Series of 1928 notes, all the same size with similar design features, went into circulation in 1929. Since then, the $10 note has featured Hamilton as the sole portrait. In 2015, Secretary of the Treasury Jacob Lew announced that he planned to request the redesign of the $10 note to feature a historic American woman in the place of Alexander Hamilton, as well as to update the security features on that denomination. After his announcement, the Treasury received a lot of feedback, some from fans of Hamilton who advocated for keeping Hamilton on the note. After collecting a large amount of public input, Lew announced Hamilton would keep his place on the ten and maintain a strong presence on our national currency, and the treasury would pursue other plans for adding a woman to our paper money. With this news, it looks as though U.S. currency will continue to tell Hamilton’s story! Jennifer Gloede is the outreach and collections specialist for the National Numismatic Collection. The museum recently collected two Hamilton-related objects, including a costume from the musical and a portrait of Elizabeth Schuyler Hamilton. Which two people who were not presidents are depicted on current U.S. currency? Alexander Hamilton and Benjamin Franklin!